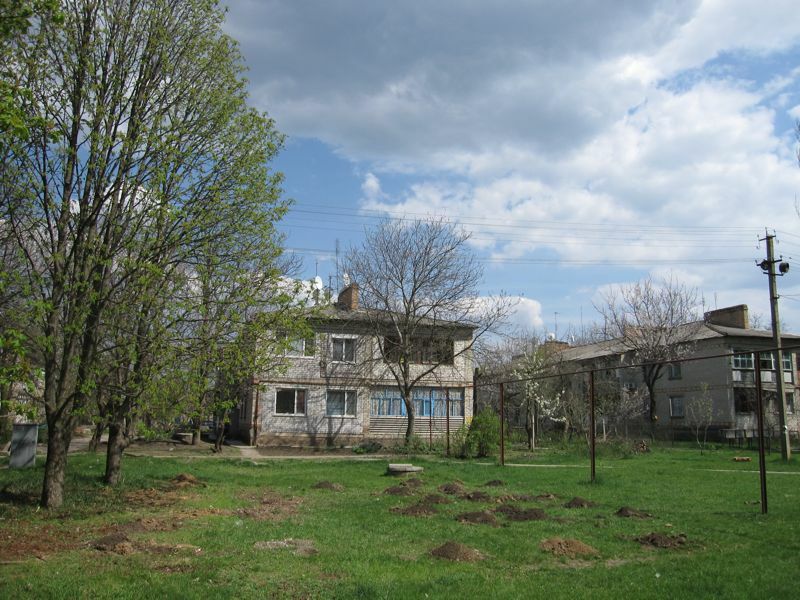 On April 28th, the post holes had been dug in the Milaritivniy neighborhood—near our very first apartment (where we lived our first month at site). Within a few days, the fence had been installed and painted. 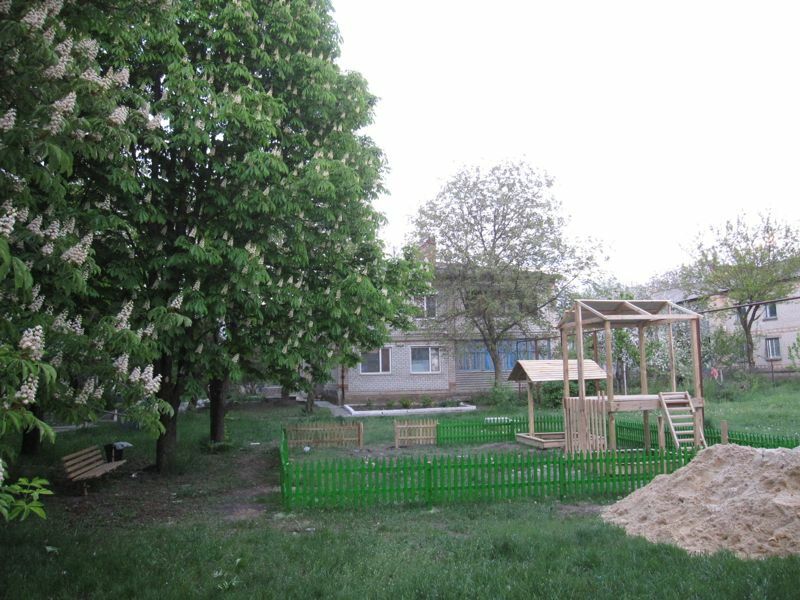 Our third playground is in a neighborhood called Milirativny. A bit farther out towards the edge of town, it’s the neighborhood where we lived during our first month in Sofievka. We chose a nice spot in a grassy area near some chestnut trees in front of the apartment buildings. 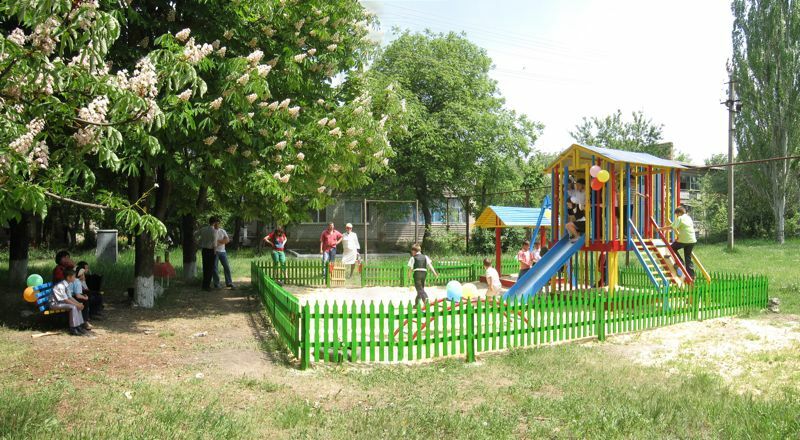 The timeline for this playground paralleled the one in Molodyozhny. 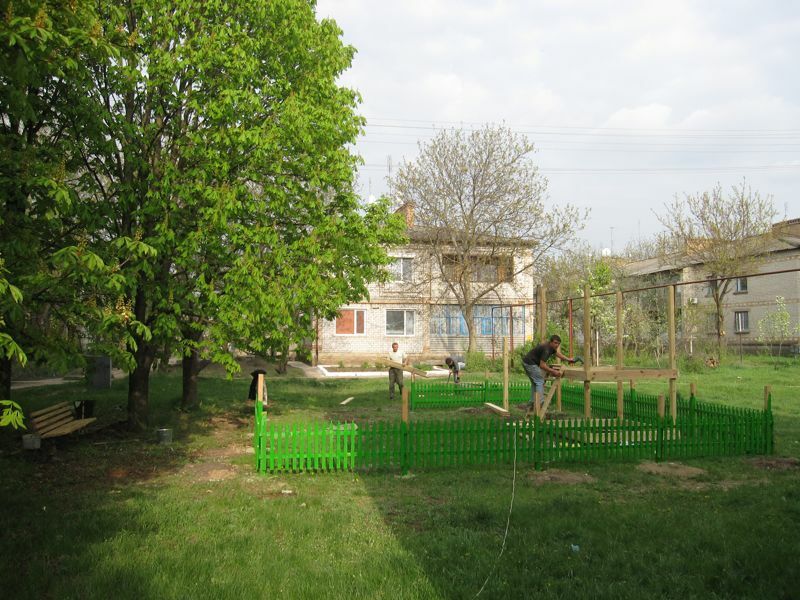 We painted the fence here in early May theday after we finished the fence at Molodyozhny, and we waited the same two weeks for the carpenters to build the rest before we could paint it in another marathon volunteer day. The residents really came through for us and helped, though, and the results are something to be proud of. As we held the final opening ceremony here and watched kids running around, we felt a great deal of pride at what we managed to do for our beloved hometown in Ukraine. Thank you again to everyone who supported us and made this possible. 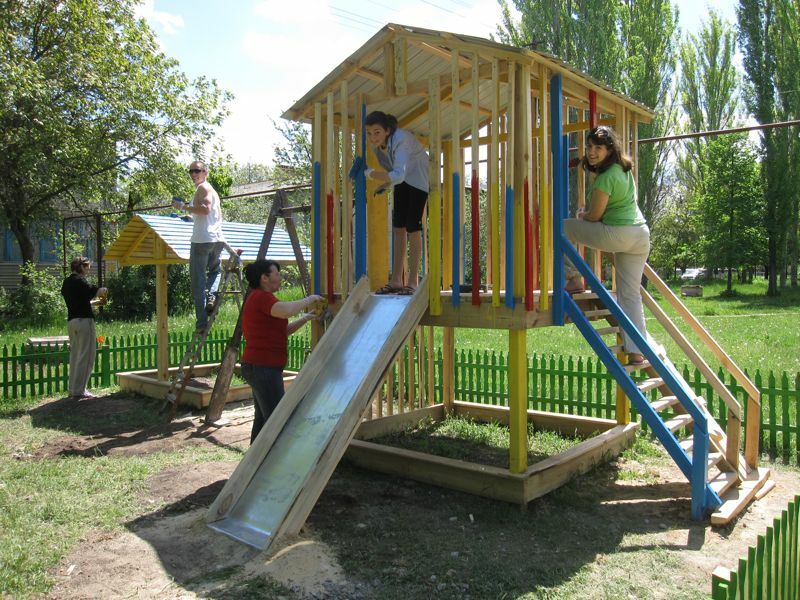 The people of Sofievka won’t soon forget your generosity! A week later, the bench and trash can were finished, and the other structures had been started. It was a great day for painting playgrounds - and we were experts by then. Superstar volunteer Solya and another local kid cut the ribbon. 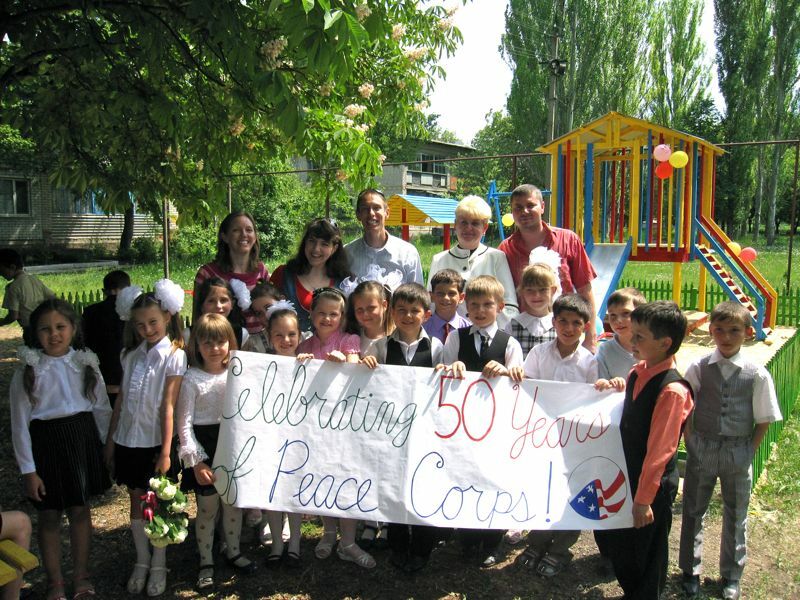 Congrats to Peace Corps for making it 50 years! Finally, more than a month after it was begun, the Milirativny playground is finished and open for business! Another great playground. We’re so proud of you all. I appreciate the updates on all the playgrounds and especially enjoyed the pictures….you guys did a super job! Are you coming to Iowa anytime soon….new baby arriving in August you know….Safe travels back to the USA!